Reading Questions. Lo and Yeung, 2007: Schuurman, 2004: Chapter What distinguishes data from information? How are data represented? Download "Reading Questions. Lo and Yeung, 2007: 2 19. Schuurman, 2004: Chapter 1. 1. What distinguishes data from information? How are data represented?" 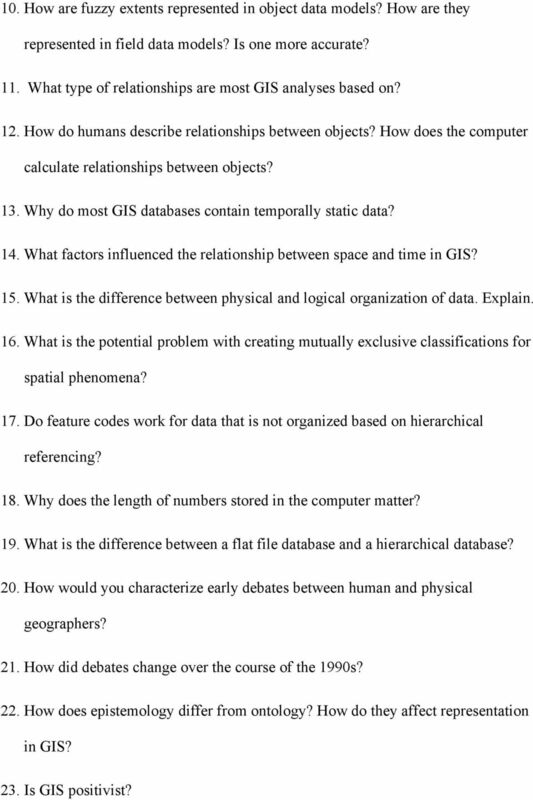 1 Reading Questions Week two Lo and Yeung, 2007: Schuurman, 2004: Chapter What distinguishes data from information? How are data represented? 2. What sort of problems are GIS designed to solve? 3. What makes GIS GIScience? 4. Are data singular or plural? 5. What are some of the antecedents to GIS today? 6. What conceptual realization stoked the growth of GIS in the 80s and 90s? 7. What distinguished hybrid data management systems for geo-processing? 8. What is an information infrastructure? 9. What does NSDI stand for? 10. What effect, in principle, should a spatial data infrastructure have on public participation in democratic processes? 11. How would you characterize GIS identify crisis? What role does history play? 12. What kind of questions does GISystems ask? GIScience? 13. Who is Michael Goodchild? What role did he play in the development of GIScience? 14. What kinds of analysis does GIS do? Give examples not in the book. 2 Week three Lo and Yeung, 2007: 36 42; Schuurman, 2004: What are plane coordinates? Do they account for the curvature in the earth s surface? 2. What are four methods of determining the position of point A relative to points B and C? 3. What is the advantage of digital mapping? 4. What advantage does RADARSAT have over other types of remotely sensed imagery? 5. What is the principle behind differential GPS? How does it improve the accuracy of GPS readings? 6. What is hierarchical referencing of attribute data, and how is it used? 7. When collecting attribute data, are all instances of a spatial entity usually sampled? 8. What are the four levels of measurement used for spatial objects? Do all spatial entities fall into one category? 9. What is a data model? 3 10. How are fuzzy extents represented in object data models? How are they represented in field data models? Is one more accurate? 11. What type of relationships are most GIS analyses based on? 12. How do humans describe relationships between objects? How does the computer calculate relationships between objects? 13. Why do most GIS databases contain temporally static data? 14. What factors influenced the relationship between space and time in GIS? 15. What is the difference between physical and logical organization of data. Explain. 16. What is the potential problem with creating mutually exclusive classifications for spatial phenomena? 17. Do feature codes work for data that is not organized based on hierarchical referencing? 18. Why does the length of numbers stored in the computer matter? 19. What is the difference between a flat file database and a hierarchical database? 20. How would you characterize early debates between human and physical geographers? 21. How did debates change over the course of the 1990s? 22. How does epistemology differ from ontology? How do they affect representation in GIS? 23. Is GIS positivist? 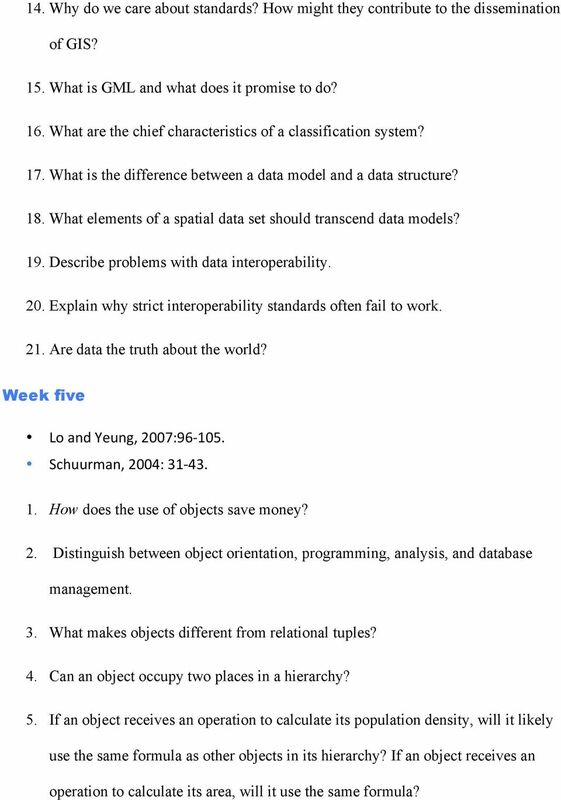 4 Week four Lo and Yeung, 2007: ; Schuurman, 2004: Chapter Why does data quality matter? How have perceptions of the importance of data quality changed since the 1970s? 2. What four qualities should data have in order to be fit for use in GIS applications? 3. What is accuracy? Precision? 4. What does precision mean when using qualitative or categorical data? 5. What is the difference between inherent and operational data error? 6. What is spatial autocorrelation? 7. 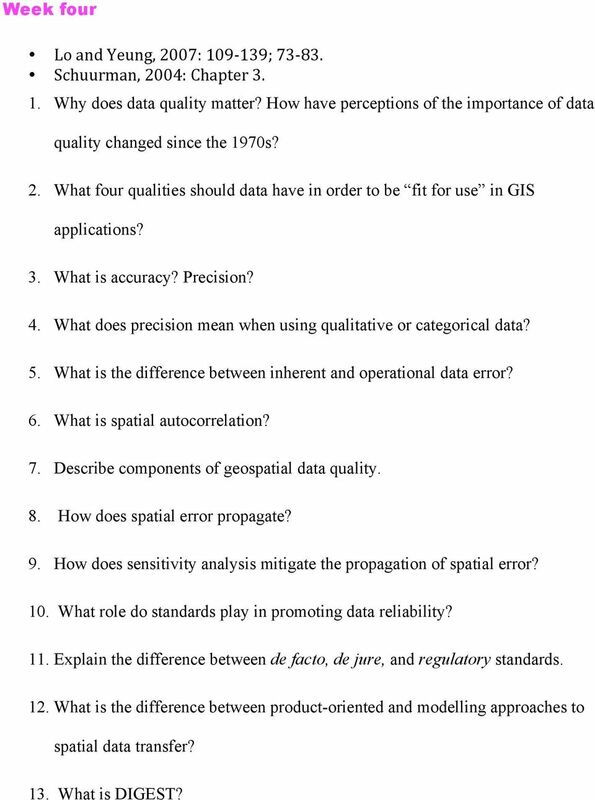 Describe components of geospatial data quality. 8. How does spatial error propagate? 9. How does sensitivity analysis mitigate the propagation of spatial error? 10. What role do standards play in promoting data reliability? 11. Explain the difference between de facto, de jure, and regulatory standards. 12. What is the difference between product-oriented and modelling approaches to spatial data transfer? 13. What is DIGEST? 5 14. Why do we care about standards? How might they contribute to the dissemination of GIS? 15. What is GML and what does it promise to do? 16. What are the chief characteristics of a classification system? 17. What is the difference between a data model and a data structure? 18. What elements of a spatial data set should transcend data models? 19. Describe problems with data interoperability. 20. Explain why strict interoperability standards often fail to work. 21. Are data the truth about the world? Week five Lo and Yeung, 2007: Schuurman, 2004: How does the use of objects save money? 2. Distinguish between object orientation, programming, analysis, and database management. 3. What makes objects different from relational tuples? 4. Can an object occupy two places in a hierarchy? 5. If an object receives an operation to calculate its population density, will it likely use the same formula as other objects in its hierarchy? If an object receives an operation to calculate its area, will it use the same formula? 7 Lo and Yeung, 2007: Schuurman, 2004: Chapter How is position of grid cells determined in raster systems? 2. What is a tessellation? 3. What is the chief advantage of quadtrees? 4. What is the guiding principle behind raster compression? 5. What does MrSid stand for? What does it do? 6. What is the difference between lossless and lossy compression? 7. What makes the raster model so attractive? 8. What is the MMU? How does it influence raster grid size? 9. How are objects represented in a raster data model? Week nine 1. 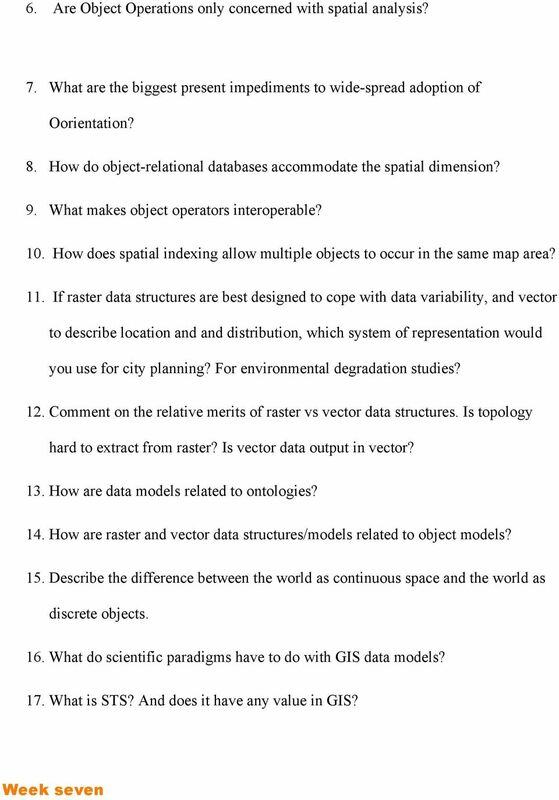 Lo and Yeung, 2007: Is the vector data model/structure object-based conceptually? In terms of geometric implementation? What is the different between a vector data model/structure and an OO data model? Explain. 3. What is the difference between a spatial entity and a graphical entity? 4. What popular drawing software uses spaghetti data structures? 5. What does a feature identifier (FID) do? 6. Does topology matter if it is computed on the fly rather than manually? 8 7. Is ArcGIS a hybrid geo-relational data model? Why? 8. What is the economic imperative for object orientation? 9. Explain how classes are linked to inheritance. 10. What is the relationship between operations and polymorphism? 11. How are the identification of objects and classes affected by social and institutional contexts? 12. Is OO data modelling widely accepted in GIS. Why or why not? 13. How does the object relational database model handle geometric types? 14. Does Arc SDE s spatial index sound more like a B-tree or a R-tree? 15. What do ontologies have to do with the different ways that raster and vector data structures represent spatial entities? 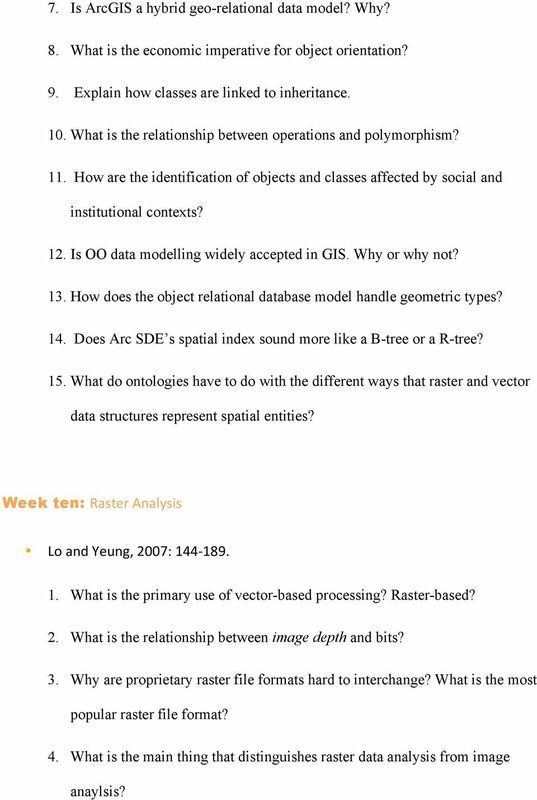 Week ten: Raster Analysis Lo and Yeung, 2007: What is the primary use of vector-based processing? Raster-based? 2. What is the relationship between image depth and bits? 3. Why are proprietary raster file formats hard to interchange? What is the most popular raster file format? 4. What is the main thing that distinguishes raster data analysis from image anaylsis? 9 5. What are five advantages of raster-based GIS? 6. What are three dominant forms of raster data available from the USGS? 7. What is resampling? Which technique best uses SAC? 8. Is overlay a reclassification exercise? Is it a local operation? 9. Can spatial data aggregation draw out patterns in the data? 10. What is filtering used for? 11. What scale of operation do environmental models tend to use? 12. What is the relationship between area and perimeter? 13. What two colour models are used for computer output? 14. What is error propagation and how is it related to cartographic modelling? 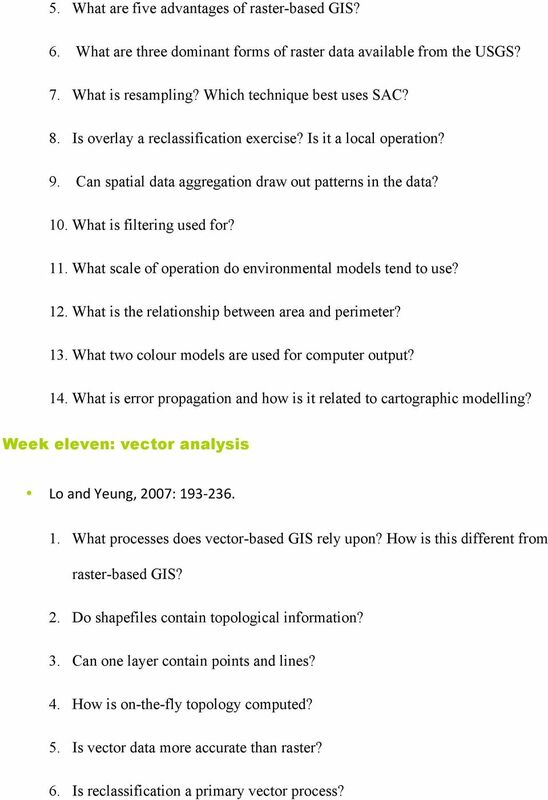 Week eleven: vector analysis Lo and Yeung, 2007: What processes does vector-based GIS rely upon? How is this different from raster-based GIS? 2. Do shapefiles contain topological information? 3. Can one layer contain points and lines? 4. How is on-the-fly topology computed? 5. Is vector data more accurate than raster? 6. Is reclassification a primary vector process? 10 7. What are the three key SQL operations used in vector GIS? 8. Is Geocoding different from georeferencing? 9. Are buffers normally variable? 10. Give one unique example of reclassification of vector data. 11. What are the components of a network layer? 12. Are universities or companies developing standards for component ware? Explain. Week twelve: visualization and cognition Lo and Yeung, 2007: ; Week thirteen: scale generalization Lo and Yeung, 2007: Schuurman, 2004: What is the relationship between the capacity of computer storage and representation? 2. What is metadata? 3. What are the chief methods of generalization? 4. What is the difference between database generalization and cartographic generalization? 5. What are the limitations of the representative fraction in a digital world? 11 6. Is the MMU very useful for vector data? Raster? 7. If you resample a DEM to increase the number of data points, do you increase resolution? 8. What are the main elements of the FGDC content standards for metadata? 9. Are standards for metadata likely to work? What about other types of standards? Assessment Tasks Pass theory exams at > 70%. Meet, or exceed, outcome criteria for projects and assignments. What Should a GIS Librarian Do? ENVI THE PREMIER SOFTWARE FOR EXTRACTING INFORMATION FROM GEOSPATIAL IMAGERY. 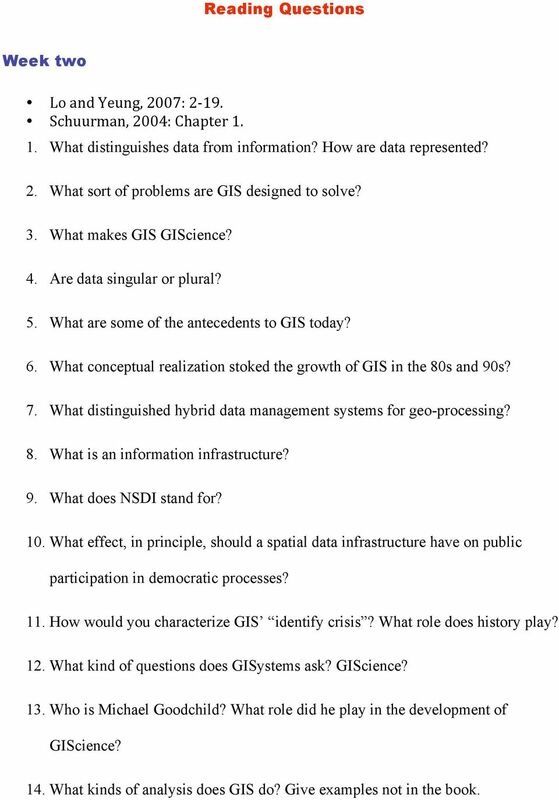 The GIS Primer provides an overview of issues and requirements for implementing and applying geographic information systems technology. The UCC-21 cognitive skills that are listed above will be met via the following objectives. GIS Data in ArcGIS. Pay Attention to Data!!! Office hours: 1:00 to 3:00 PM on Mondays and Wednesdays, and by appointment. WATER INTERACTIONS WITH ENERGY, ENVIRONMENT AND FOOD & AGRICULTURE Vol. 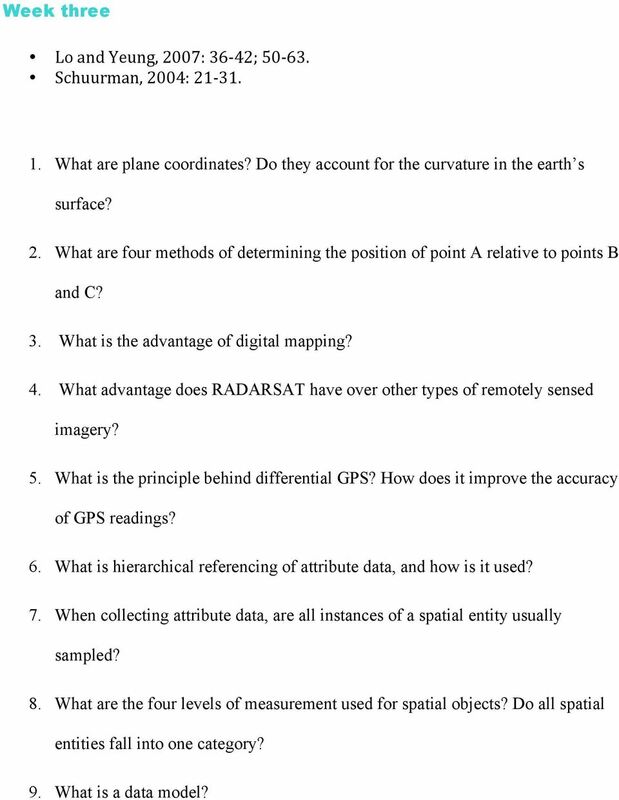 II Spatial Data Handling and GIS - Atkinson, P.M.
About scope of OpenGIS technology in oceanographic data management and visualization Andrey V. Golik, Vitaly K. Fischenko, Stepan G.
What Is Geographic Data and Where Can I Find It? Esri International User Conference San Diego, California Technical Workshops July 23-27, 2012 What Is Geographic Data and Where Can I Find It? Miriam Schmidts Geri Miller Agenda What is Geographic Data?